Well it's over, my fifth and possibly final Charles Reid workshop in 6 years. I only intended to go to one originally but kept coming back for more. Why the final one? Charles is only coming to the UK every two years so the next one would be in 2015, when we will all be two years older. Age is something I'm becoming more conscious of, even though my father was almost 96 before he departed. Will Charles and Judy come again? When I said goodbye to him his words were `see you again' so who knows. This workshop was different to the others in that it was not residential. This was due to increasing insurance costs which rapidly increase as we get older and that was the case here. Jane Duke, who has organized Charles Workshops in the UK in the last few years, told me 2015 hadn't been mentioned although he was going to Italy in 2014. With all the travelling involved throughout the United States and abroad it must be very tiring for Charles and Judy, as I well know, Charles and I being very close in age. As the students were aware that Charles, Jane and Judy were staying at the Grapevine Hotel six also elected to do so, eleven more spread around various other hotels and B & B's in Stow. As I had free board and lodging with my sister a short drive away it was no contest, although as a result I partially missed out on the social side of the workshop. Charles seemed to me not quite his old self on the first four days, although his paintings were as good and exciting as ever. That's one of the great things about artists - their painting skills never seem to leave them. The week after Stow was Burford and Genevieve Buchanan was there - I had met her previously - and she tells me it was excellent. By now Charles will have finished filming the DVD at Burford with Town House Films, and I imagine he and Judy will be back home. I gather it will be called `Cotswold Sketches'. On previous workshops on the last evening an exhibition was held of the students paintings, to which any other residents and staff were welcome to visit. This enabled me to photograph them but that wasn't an option here and I apologize for that omission. Instead you will have to make do with my modest efforts. In previous reports I've said I was unhappy with my paintings. I had hoped to go out in a blaze of glory but it wasn't to be. I abandoned this one as I was unhappy with my handling of the greens above the rim of the vase. This was average but inferior to the one hanging in my studio, painted at Urchfont (now sold to a private owner) four years previously, again the greens poorly handled.. The plein air study painted on the second day. I have detailed Charles remarks about it earlier. This was my third attempt, another unsatisfactory result. After these tales of woe I determined to do better on the final day, which was the portrait session. 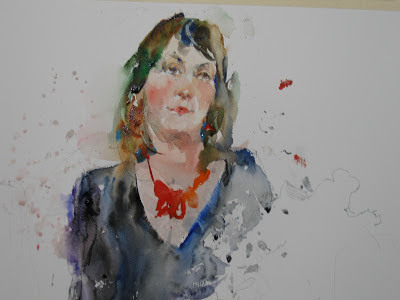 It was my turn to be on the front row for the demonstration, along with three others, and this carried over in positioning ourselves when we painted Jane. You can see what an advantage I had regarding position. When home I made some small changes, one being the left hand line of the face, otherwise I was pretty pleased with it, especially given my previous efforts. Strangely enough I thought Charles seemed much more like his old self on the final day, but perhaps it was me who perked up. Did I learn from this workshop? I'm sure I did as it reinforced a number of things where I'd regressed and also refreshed me despite the aforementioned difficulties. When I've had more time to digest this workshop, and it's lessons, I may return to the subject. For now that's it folks I'm exhausted! Friday, the final day of the workshop dawned with much better weather, although as we were indoors this didn't matter. The subject today was the much anticipated portrait/figure session and the model was Jane, who I had first seen modelling for Charles in 2007, on my very first workshop at Burford. I gather she has also done so subsequently. I have a photograph of the painting Charles did on that occasion, which is one of my favourites, now owned by our organizer Jane Duke. You will note it was combined with flowers and other objects, quite a different approach from today's painting. Charles began with a faint outline creating a silhouette. He then made the head smaller and drew the hands which he does very carefully, where things intersect. Charles took regular breaks as much for Jane's benefit as his own. These are about every 15 to 20 minutes. Charles is very solicitous for the models well-being constantly asking if she is all right, and to some amusement initially kept mixing her name up and calling her Mary. With the face start with the eye and check position, using these as a starting point for the nose, mouth and chin. Check the corner of the eye with the face, the other side with the hairline. The next key problem is the length of nose which students often get wrong. Don't make a hard line of the light side and stress the upper line of the nostril without making it into a black hole. Use mouth for the distance to the hair. At bottom of chin go to the neck making the chin line faint and subtle. Keep losing lines by erasing. Note this is an accurate but not detailed drawing- quite loose in fact.. The initial loose washes. Plenty of paint and water using an Escoda 1212 Kolinsky sable size 14. This is larger than any I have and I was able to examine it between breaks. It is a lovely brush and I'm sorely tempted to invest in one (I just have). In general the equivalent Da Vinci Maestro Series 10 is roughly two sizes larger, but comparing the diameter of the No.14 brush heads is only fractionally wider, while costing 50% more. I don't have a length comparison but I doubt there is a lot in it. The painting has now dried before Charles moves to the next step. Started detail changing to the Da Vinci Maestro 35 size 6, I think the number is different in North America, which is longer and slimmer (and more expensive) than the Series 10. Charles stressed that you shouldn't do the eye as a solid block but in pieces, placing paint. He adds green and Raw Umber, Cadmium Red at corners, over the top Cerulean and a little red, but not on the upper lid. He works wet in wet with up and down strokes then the eyebrows.. Don't overstress under the eye. Don't stroke - press the brush, Soften edges as you go. Edge control is really important. He restates quite a lot. Next the nose painted with Cadmium Red and Raw Sienna. No blue in the nostril just a dot. Under the nose and indicates mouth with light wash. First step the centreline - don't make too dark! Constantly softens and corrects. The mouth is completed then the lips and chin. Stay away from sides -stay in centre. Starts on chin, softens adding red and brushes away from it. Don't leave a pronounced chin line. A start on the hair and hat. Note they are painted as one shape and not separated. Don't fill out the hair leaving an escape route. Use the same colours under the hat brim and paint out into the hair. Colours mentioned here Ivory Black and Burnt Umber. Further work to define the hat. Charles used a minimum of strokes (5) for the hair/hat and said more screws it up! Small final touches as he reviewed painting. Some white gouache was added at the end, although looking at the painting it isn't obvious where. He always says don't spend too much time on the hair, although in this instance the hat and hair are combined as one large shape.. The sequence above shows the final result. This was a fascinating session and you could hear a pin drop most of the time, although Charles constantly explains what he is doing and why. We then broke for lunch and unfortunately as it was Friday and nearing the end four of the students departed, as they had long journeys and connections to make. This meant only thirteen remained for the afternoon session. As the weather was somewhat better I went down to a fish and chip shop I'd noticed called Greedys and bought some for my lunch. They were excellent and I enjoyed them sitting on a seat at the area where Charles first painted outdoors. I realise these notes are a little rough but it isn't easy to write down or remember everything. I hope nevertheless that they convey the gist and flavour of the demonstration. When we reconvened at 1.30.pm the students sorted themselves out position wise and began to draw and paint the model. 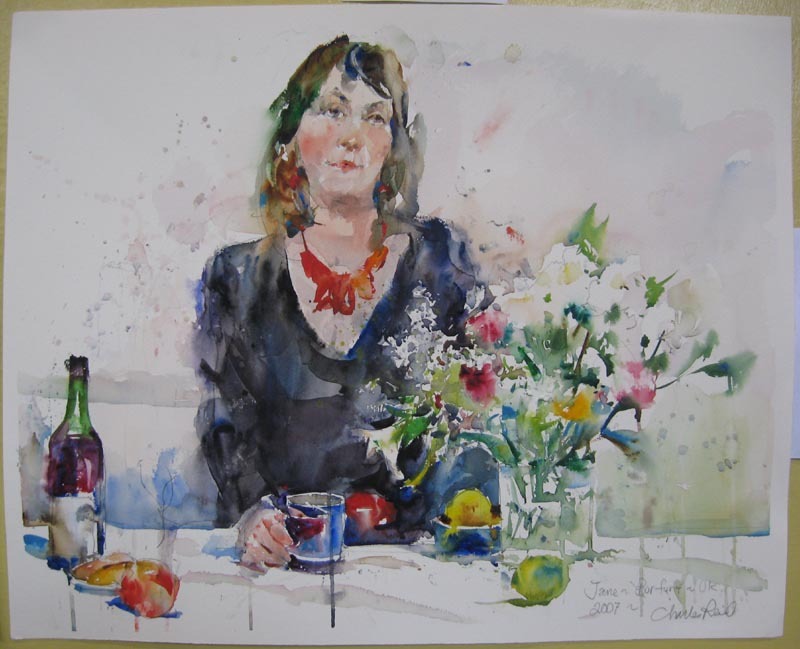 As it was my turn on the front row this carried over to the painting session and I was able to position myself closer to Jane and also only slightly to the side. I think this gave me a considerable advantage over some of the others. I shall cover my efforts, and explain why I wasn't able to photograph other student paintings, in a final post in the next two days. 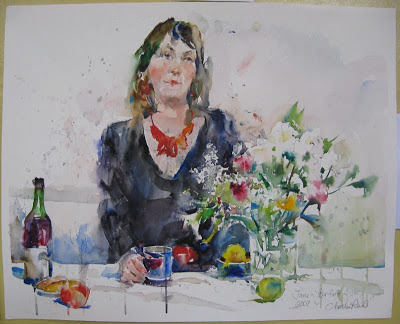 For those who are interested in Portraits the Charles Reid way I recommend the DVD `Figurative Watercolours' (APV Films 2012). Portraits feature in many of his books but the ones that stick in my mind are his final book `Watercolour Solutions' and `The Natural Way to Paint'. Both can be obtained from Amazon and some other booksellers. With the weather again inclement it was decided to repeat yesterdays subject of a Flowers/Still Life arrangement. Before going any further I should have explained that the way his workshops are planned is that Charles paints, demonstrates and instructs, while Jane and Judy ensure that things run smoothly throughout the week. This isn't as straightforward as it sounds. For example the caretaker had said we must not get paint on the carpet, although there were plenty of marks on it already. This involved putting down sheets of cellophane and taping them together! For the Flower subjects they arrived with an enormous bunch of flowers, a bag of fruit and some vegetables, the flowers then split and arranged into five separate bunches. When this was being done I commented to Judy about the preponderance of white flowers. This was when she said Charles likes painting them. On this occasion he chose a different arrangement. You may note the other objects not just fruit. The duck is a regular as are some of the other items. After the usual checking and re-arranging Charles commences the drawing. Charles starts drawing with the duck. He draws the vase - inside first. Don't draw straight stems look for ovals. He said the place you start is not as good as the place you end up or vice versa. This was his palette for today with added paint. Compare it to yesterdays photograph. The initial application of paint which always begins in the centre by the rim of the vase. Note the Cobalt Violet. Use single strokes and keep the brush on the paper. You thus start darker and end lighter. Vary the direction of your brush strokes. When painting the bottle the brush takes different directions. The colours on it are made up, Lemon Yellow and Cobalt Blue were mentioned. It isn't always easy to follow Charles as he often improvises as the mood takes him and is certainly not regimented in any way. Things begin to take shape. Flowers are just indicated without any real detail. See how things develop. Note how the white flower is moved to just above the rim to break up the greenery. Charles always says don't overdo the leaves. The flowers are virtually finished. Not a great deal left to do. The students paint under Charles eagle eye. Following Charles demo a second critique took place in which students offered up another painting. Charles commented on each one after asking what the owner felt about it. We then broke for lunch and recommenced at 1.30.pm, everyone selecting a different arrangement to previous. I did not have a good session and scrapped the first two attempts, one at a very early stage. I'm afraid I was somewhat distracted by phone calls I'd received on Wednesday afternoon from the estate agent involved in my house selling/ buying, which is causing a lot of grief, and lost concentration. That sounds like a cop out and probably is, although the painting I did then was better than on this day. Painting carried on until 4 -5.pm with Charles supervising as you can see above. We then dispersed with the much awaited portrait session scheduled for the final day. After my poor performance so far I determined to finish on at least a higher note! One sad (but happy) note. Latifa Kostas, a Charles Reid regular for some years left at midday to return to London. We were told the following day that she now has another granddaughter! Latifa never paints between workshops as she says she is just too busy. Over the course of the week you can see how her painting improves and is much better at the end than the beginning. I noted this on previous workshops and have told her so. A salient lesson that painting regularly is essential if you really wish to progress. Wednesday dawned, a thoroughly miserable damp and cold day, quite a contrast from Tuesday, but as we were indoors and the hall was well heated this wasn't a problem. The subject was Charles trademark combination Flowers/Still Life. Charles Craig Young palette. Note the small amounts of paint and his latest addition Cobalt Violet, in the bottom right position. His two greens are Oxide of Chromium and Viridian but he also mentioned Cobalt Green Dark and you can see two shades in the third pan across, second row down. Charles also talked about only putting out sufficient paint needed as it must be fresh, nice and juicy, so that the tip of the brush digs into it. Sometimes he mixes on the palette, quite often straight from paint well to paper. As for makes he mentioned Winsor & Newton but had many tubes of Holbein, his long time choice, in his box. Charles started with a quite complicated drawing using on this occasion some Schut very rough paper. He draws lightly, using a mechanical pencil, and when painting will improvise. Mostly he uses Fabriano Artistico paper, although he likes Schut Noblesse, which isn't generally available. The Schut rough he used - I'm not sure what it is called - is very rough and can give a different effect, although not the easiest to paint on. He also likes the Czech Moldau hand made paper. This was the subject and Charles spends some time moving things around, both flowers and objects until he gets them exactly where wanted. When he started painting he usually starts at the rim of the receptacle and likes to let paints work together, with a quite complicated interaction between the green leaves and flowers. He paints shapes rather than things and connects stems when the flowers are still wet. The flowers are painted first - shapes not things. Value is more important than colour. You will note that he likes to have a flower(s) in the lower position rather than a mass of green leaves as in the actual composition. Apparently he particularly likes to paint white flowers, not everyone's favourite colour. He starts adding the window frames and said you must vary the colour. He added some background, painting around the window frame. Avoid `mushy' colour apart from shadows. The darks are incorporated as he paints - no adding later. Timing is important as if too wet you can get a mess. The finished painting a typical Charles Reid speciality, with many at this workshop particularly interested in this part of his repertoire. As usual Charles takes regular breaks - every 20 minutes or so - and goes outside to smoke his pipe. I noticed on more than one occasion clouds of smoke emanating from it! Probably contemplating a tricky bit. Charles is very communicative when painting, only occasionally going quiet when he needs to especially concentrate on a particular section. Part of the reason for the breaks is to let parts of the painting dry before pressing on. It isn't all wet-into-wet. He is actually quite pragmatic in his approach. Together with the subject Charles painted, four other still life's - all with the same basic flower theme - were set up for the students afternoon painting session. groups of three to four congregating around each one. Charles circulated and commented on work in progress, while helping those who asked for assistance. One thing I've missed is the critique, which took place at around noon or a little earlier after Charles had finished his demonstration. Each student was asked to submit one painting which Charles would then comment on. In my case I submitted the painting of Chris at the Stow Lodge Hotel. I mentioned earlier Charles made one basic criticism that the tree looked out of place and, the painting would be better without it - also the tree colours were too cool - the rest being okay. The afternoon finished at around 4.30pm and all headed for their hotels, most thoroughly exhausted, or in my case a 20 mile car journey to my sister at Ducklington. Exhausted? After such intense concentration you usually are. Charles commented earlier that a two and a half hour session was enough for him during a day, and he found it hard to understand how some artists painted all day.